Summary: It's early summer when Ginny and William's peaceful life in Vermont comes to an abrupt halt. I am a big fan of the Reagan Arthur imprint - -so big, in fact, that I am co-hosting the Reagan Arthur Books Challenge with Kathy/Bermudaonion. All of the books I've read so far have been in keeping with their focus: "great writing in the service of great stories"; and I've enjoyed all of them. 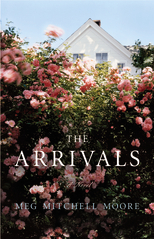 But the latest one I read, THE ARRIVALS by Meg Mitchell Moore, is definitely up there as one of my favorites. I just adored this book! Based on the book's description, I had a feeling that I was going to, at the very least, like THE ARRIVALS -- I am always up for a good story about families. However, I had no idea how much I was going to love this book! And if you ever have tried to write a review about a book that you loved, you know how what a daunting task that can be. I just don't know if I can put into words the many, many reasons I enjoyed this book so much. Honestly, I just want to say "READ THIS BOOK!" But I feel as if I should at least try to highlight some of the very special things about THE ARRIVALS. First and foremost, I think Ms. Moore is a wonderful writer and I thought she did quite a few things very well in this novel. I loved the characters she created and I thought they were all truly authentic (I felt as if I knew these people.) I also thought their actions, while not always wise, were extremely realistic as was their dialogue. But the real beauty of Ms. Moore's writing was in how she told this story. The story was written told through the eyes of the different characters' and it just worked so well. The transitions were almost effortless and I thought she did a great job with the individual perspectives. I also really appreciated the story itself. (I do love stories about family dynamics, but I have to question what that says about me?) I can only imagine the situation that this family faced... an empty nest couple suddenly finds their home inundated with all three of the children (and their families.) While it was exciting for a few days to have their entire family together, things do become a bit hectic and very crowded. As the parents realize that all three of their children are dealing with their own set of issues, they learn that they can never stop being parents. While this family's situation was, at times, very funny -- dishes, clothes, and toys were everywhere, makeshift beds on the floor, and a broken washing machine, I was very much affected by what the individuals were going through. Lillian, their oldest daughter and mother of two young children, is escaping from her philandering husband and her life as a stay-at-home mom. Stephen and his pregnant wife Jane arrive for a weekend visit but are forced to stay when Jane is put on bedrest for the duration of her pregnancy. And finally, the baby of the family Rachel comes home after she realizes that her life and job in New York City aren't living up to her expectations. You know, I probably most related to Lillian because of the whole stay-at-home mom issues, but I also felt sorry for what the other siblings were coping with. However, my heart really went out to their parents. Their calm and orderly home was turned upside down... and their kids were all so unhappy. I thought THE ARRIVALS did a remarkable job of looking at some very interesting family dynamics. I liked how each of the adult children became kids again the minute they walked into their parents' home. (I could relate to that!) And that the parents immediately assumed the role of... well, parents. However, I most loved how this book explored the theme of forgiveness -- it was very well done. There were many times that the characters were forced to examine their actions and forgive others as well as themselves, and I loved how Lillian's relationship with the priest further expanded on this theme. As I read this novel, I couldn't help but be touched by the characters' realizations about themselves and how the act of forgiveness brought happiness to their lives. Please do consider THE ARRIVALS for you next book club meeting. This book is absolutely perfect for discussion with your friends. The characters and their problems are so real, and I definitely think readers will see these characters either in themselves or in their family and friends. Besides analyzing the characters and their actions, there are many other themes which I think warrant further discussion including family dynamics, career choices, marriage, parenting, motherhood, guilt, and (the big one) forgiveness. There is a reading guide available with some terrific questions that can help to facilitate your discussion. Thanks to the publisher for sending a review copy of this novel. This sounds excellent! We have several friends who are experiencing similar things. Great review, as always. Sounds terrific. Thanks for the great review! That's so true about going back to being a kid when you walk into that door at your parents'! I think I need to read this. My 23 year old son just moved back home around Easter and it is an adjustment. It's hard not to be the mom I was when he moved out. I really think this sounds like a great book. Great review! Oh I've heard SUCH good things about this!! I need to get my hands on it. Thanks for the review! I am looking forward to this book. I knew I wanted to read it when saw it was a RA book. This sounds amazing. Will add it to my TBR list. Thank you so much for this wonderful review. I am sorry I'm coming across it so late! Much appreciate the careful read and thoughtful comments.